Believe: My Sweet Petunia and Ink Blot Shop Blog Hop!! My Sweet Petunia and Ink Blot Shop Blog Hop!! Hello everyone!! Welcome to a super fun blog hop between Ink Blot Shop and My Sweet Petunia! Ink Blot Shop is a new stamp company with super cute and adorable images, you have to check them out. For today's hop I am using this super cute set "Floral Frenzy", this set has so many possibilities, you can go from super cute to very elegant in no time. Just really adore this set. Of course for all my cards I used my Original MISTI to get a perfect and crisp image. I started stamping the rose in Antique Linen Distres Inks all over my white piece of cardstock. After that I colored the roses using 2 Spectrum Noir markers FS2 and FS5 then I added outline with a brown pencil and the leaves with DG1 and DG2 and a green pencil. After I finished coloring the image I die-cut it twice, yes, the outside edges I used the scallop rectangle stitched die and a rectangle stitched die in the middle. I adhered the outside die-cut piece direct to a light pink card base, then I added foam tape to the middle die-cut piece and adhered it to the card base. Added a die-cut sentiment and voila, card was finished! I honestly love how this card turned out!! I hope you too! This is very similar to the previous one, I stamped the images on a piece of white cardstock in Antique Linen Distress Ink, then I colored and outline them using Chameleon Colored Pencils. They are super smooth and blend quite wonderful. Then I die-cut the image using rectangle stitched dies as well as a kraft piece to add behind the image. Both layers were added to a white card base using foam tape. Finally, added gold sequins, white pearls and a die-cut hello sentiment in gold cardstock. Yep, I couldn't stop and I made another Hello card, this one was the easiest to put together. First, I stamped the images on a piece of white cardstock, no coloring needed. I adhered the images to a kraft tag and set it aside. Then I created a background using a transparent piece of Yupo paper and alcohol inks, so much fun!! I die-cut the piece with scallop rectangle dies and adhered it to a white card base, then added the tag and pink rhinestones and a Pink Hello die- cut sentiment. WOW! Your cards are jaw-dropping gorgeous. Can't even imagine attempting those WITHOUT the MISTI. Wow, Giovana! I couldn't even recognize my own stamps in that Thinking of You card! ♥ Amazing! They are all lovely! These cards are lovely. Great coloring! I can't even pick a favorite as they are all gorgeous! Lovely cards... I especially like the alcohol ink background. The alcohol inks on yupo paper are so pretty! Gorgeous cards! Love the pretty colors you used! Beautiful floral images! Thank you for the fabulous projects inspiration!!!! Busy lady! Each one is so beautiful. Love my Misti and heading over to see the products at Ink Blot. Thanks for the inspiration. Beautiful cards!! those florals are to die for! I like your gorgeous cards. Thank you for such beautiful samples of this fun new company! Can hardly wait to see the rest of the line up!! Wow!!! Beautiful cards and colouring!!! Gorgeous cards - the colors are so pretty and cheerful! Thanks for sharing! The two first cards are so lovely and that third one is PERFECT for a tween or young teenager!!! Wow, all of your cards are great, but I think your first card is absolutely stunning! I love your coloring!!! Wow, gorgeous cards! Each is so distinctly different, lovely! Your flowers are wonderful. I like the first one especially! These florals are just lovely. Thanks for the inspiration. Wow ! You’ve made a wonderful set of cards !! Three beautiful cards and so gorgeously colored!! Wishing I had a MISTI and hoping to win so as to make such cards like these! Impression Obsession Spring Hop Day 2!!! Impression Obsession Spring Die Hop!! 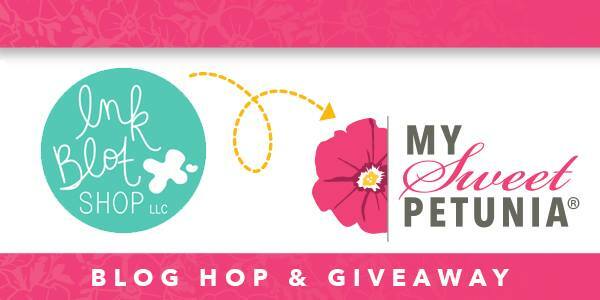 My Sweet Petunia and Pink & Main Blog Hop! Ink Pads and reinkers on sale!!! Impression Obsession Challenge: Pick Any Holiday!